Initial press reports on the resignation of Iraq’s parliamentary speaker Mahmud al-Mashhadani have followed a well-established sectarian paradigm: Sunnis are “normally” in a degree of conflict with Shiites and Kurds, and this time even the speaker’s own Sunni supporters abandoned him due to his erratic behaviour and verbal attacks against other MPs. 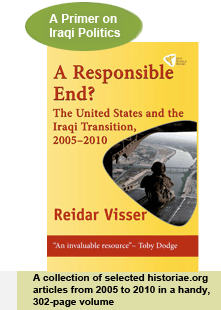 His resignation removed a problem; afterwards the Iraqi parliament, while still seen as “fractious”, passed a law enabling the government to conclude separate agreements concerning the modalities of the drawdown of non-US forces in Iraq. There is a different narrative. A few days ago, representatives of the United Iraqi Alliance (UIA, the remaining 60 per cent of the original Shiite coalition) and the two big Kurdish parties (KDP and PUK) complained that everyone wanted to sack Mashhadani except the “coordinating society” (al-tajammu‘ al-tansiqi). This somewhat secretive-sounding appellation is code for what is also known as the nationalist forces of 22 July, which defeated the Maliki government earlier in 2008 by demanding a timeline for local elections as well as special arrangements for Kirkuk to deal with Kurdish dominance there. Prior to Mashhadani’s resignation, there were supportive statements from various components of the 22 July bloc in support of him (or at least in support of some kind of reconciliatory solution that would prevent a resignation). These statements included Sadrists, the secular Iraqiyya, as well as the “Independent Arab Bloc” (which is closely linked with Mashhadani). In the wake of the resignation, the Fadila party, too, has expressed a degree of sympathy for Mashhadani and said that any resignation should have been followed by a more profound shake-up of leadership positions in the Iraqi parliament. Today’s decision seems to suggest that the pendulum has swung back again, at least temporarily, in Iraqi parliamentary politics. The nationalist forces were on the offensive for much of 2008, scoring significant victories such as the provincial powers law and the elections law. The passing of the SOFA could be interpreted in two ways: another nationalist victory through the concessions from the government in the shape of a “reform pact”, or a surrender by the nationalists to yet more empty promises from Maliki. With the resignation of Mashhadani, the latter interpretation may appear to be more plausible, with Tawafuq once more back in the fold of ethno-sectarian politicians (and already talking of holding on to their “quota” in the shape of the next parliamentary speaker), and an increased likelihood that the promises of reform will come to nothing (members of the 22 July forces complained that their nationalist stance on Kirkuk had caused fury in Kurdish circles, and Mashhadani had specifically attacked both the Kurds as well as UIA representatives, the latter for being “spies”). Those who want to challenge the ethno-sectarian quota system still have possibilities for doing so in the provincial and parliamentary elections in 2009, but the longer the current system persists, the more likely it is to put in place anti-democratic measures that will guarantee its own perpetuation. US authorities have already signalled an intention to make the “losers” in the local elections “understand” that they lost, which does not sound very promising in terms of American ability to address the flaws of the existing framework. The record of how many MPs were actually present for the vote on Mashhadani’s resignation and subsequently gave the green light for more troops agreement has been conspicuously absent from news report so far. When it emerges, it may say more about the buying power of the Iraqi establishment than about the legitimacy of the solutions arrived at. It should suffice to mention that less than a week ago, 80 members of parliament voted down a similar law on non-US troops agreements against only 68 votes in favour – in one press report this outcome was attributed to the resistance to the law by the 30 or so “lawmakers loyal to radical Shiite cleric Muqtada al-Sadr”! Actually, the voting record as well as reactions to the recent shoe-throwing episode show that national sentiment among the Iraqis is well and alive, and that no matter how much money is used to bankroll the current system at the level of the Green Zone, efforts to conceptually fence the Iraqi nation into separate sectarian compartments are likely to remain unsuccessful in the long run. Postscript: Developments on 24 December seem to lend credence to this interpretation. Hiwar and the Arab Independents are breaking off from Tawafuq, blaming the Iraqi Islamic Party for its betrayal of the concept of a “reform pact”; Mashhadani voices his preference for a Sadrist to succeed him as speaker of parliament and lauds Muntazar al-Zaydi (the shoe-thrower). In the latest developments, people from the 22 July forces have been discussing nominating a candidate from their own ranks to replace Mashhadani, with a cross-sectarian list of possible candidates (including Nadim al-Jabiri and Usama al-Nujayfi) exemplifying the stark contrast between their more ideological approach and the ethno-sectarian quota-sharing muhasasa logic that prevails in the pro-government parties (where a “Sunni” candidate is expected, and where Tawafuq refers to a “deal” earmarking the speaker’s position as “theirs”). The Candidate Lists Are Out: Basra More Fragmented, Sadrists Pursuing Several Strategies? So far, it has been difficult to discuss the upcoming provincial elections in Iraq because only the names of the parties and the party leaders have been made public. But now the Iraqi elections commission has published the candidate lists for individual governorates, showing which parties will run where, as well as the names of all persons on each list… Full story here. Posted in Basra and southern regionalism, UIA dynamics | Comments Off on The Candidate Lists Are Out: Basra More Fragmented, Sadrists Pursuing Several Strategies? The move comes after the two biggest Kurdish parties for more than one year have tried to obstruct local elections in Iraq, first voting against a fixed timeline when the provincial powers law was adopted, and later inventing a series of excuses and “problematic issues” (such as “widespread illiteracy”) to filibuster the debate on the elections law itself. When these measures failed, Kurdish leaders made up their mind and adopted the position that the Iraqi parliament had no authority to legislate on election affairs in Kurdistan anyway; accordingly no local elections will be held there. More recently, there have been Kurdish attempts to postpone elections in Diyala where there are Kurdish minorities.